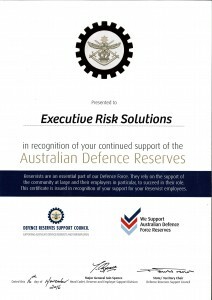 Executive Risk Solutions was awarded the WA Employer Support Award for the Medium Sized Business Category last Wednesday 16th of November, at a cocktail reception held by the Defence Reserves Support Council at the Maritime Museum in Fremantle. 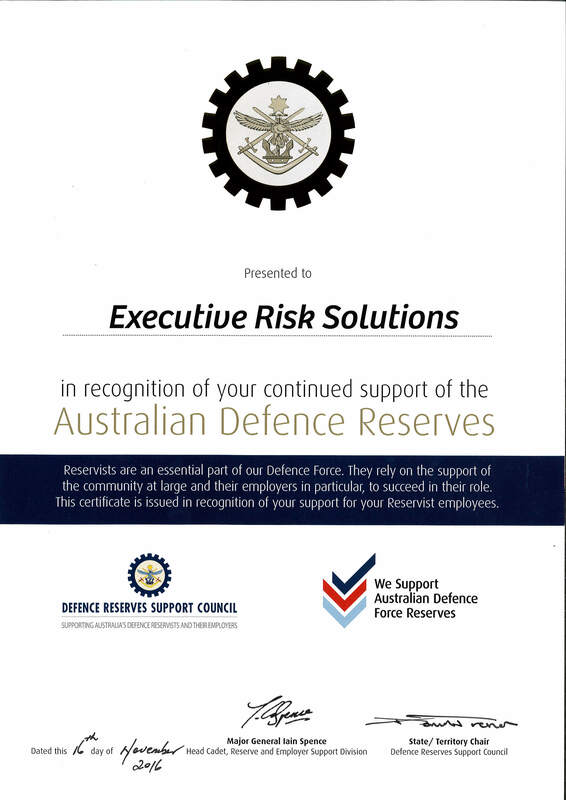 The award recognises employers who have provided continued and significant support to their Reservist employees. ERS is a proudly Australian Veteran Owned Business trusted by numerous mining and oil and gas companies, not for profit and development organisations, hospitality and leisure organisations and government bodies. The trust received by all these organisations has been acquired because of ERS’ expertise built upon a strong background from an extensive list of personnel drawn from the Military. ERS currently employs 7 Reservists. ERS is also a significant supporter of Ex-Defence Personnel with half of our senior and operational staff with military ties or previous Defence service. 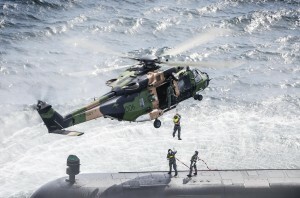 The active reservist is one of the criteria that ERS utilises in its recruitment process and ERS is very supportive of employees requests for reserve duties. Former Special Air Service Regiment soldier Scott Houston, a third generation military man who served in a number of overseas deployments including Afghanistan and East Timor leads the company as the Chief Executive Officer. Supporting Defence Personnel is close to Mr Houston’s heart. He understands, and has experienced the challenges of transition. By giving work opportunities to ex-service personnel and reservists, ERS not only facilitates their transition into the civilian world, but also delivers extremely qualified personnel to their clients and their subcontractors. There are a number of social issues that veterans face when leaving the military and one of them is the transition to civilian life. 10% of Australia’s homeless are returned veterans. 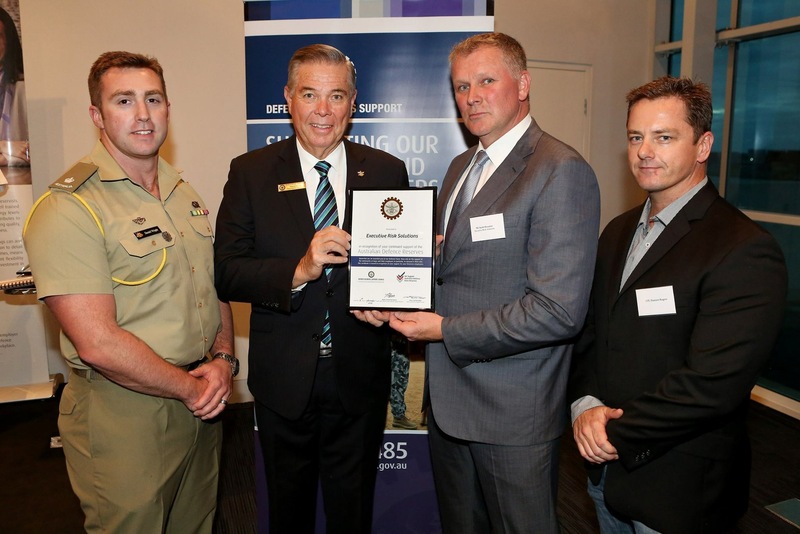 Mr Houston recognised the growing demand in the Australian job market, for a professional approach to the supply of Ex-Defence personnel who are transitioning to the civilian world, and decided to take his initiative to supporting Ex-Defence personnel to another level. Earlier in 2016, ERS Recruitment was established. 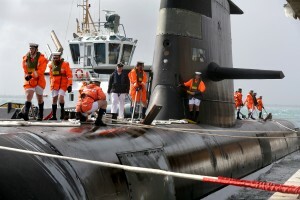 It specializes in creating pathways for Ex-Defence personnel. 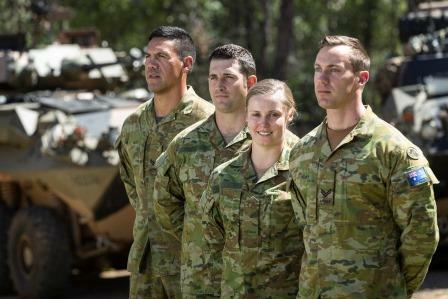 ERS is committed to making a difference in our industry by supporting Defence personnel with employment and by allowing employers to access highly skilled and trained candidates for their operations. The company’s initiative have been proven to be a great community service opportunity where businesses can actively support Ex-Defence Personnel. Well done to Scott and the team on receiving this award! If you require more information about employing Ex-Defence Personnel or any other recruitment opportunities refer to the following contacts.